NEW YORK (CNNMoney.com) -- Polaroid is trying to resurrect itself with the help of pop star Lady Gaga. The singer, known for hits like "Poker Face" and "Paparazzi," has signed a multi-year deal to be the creative director of a specialty line of Polaroid products. The PIC 1000, a modern version of the classic Polaroid OneStep camera. The move is part of a major overhaul for Polaroid, which saw its iconic instant film and cameras eclipsed by digital photos. The firm was bought out of bankruptcy in May by two venture capital firms that want to reposition it as a licensing company which will put its name on everything from cameras to printers and TVs. Lady Gaga will be their creative director and develop a line of co-branded products. "The core of [the brand] is that it's real, it's unedited, and it captures the moment," said Stephen Miller, chief executive of Polaroid owner PLR IP Holdings. "We are changing our business model and launching into the global marketplace." Gaga, whose debut album "The Fame" sold eight million copies and included five No. 1 singles, will appear at the Polaroid booth at the Consumer Electronic Show (CES) in Las Vegas Thursday morning to discuss the new line. "We have a brand that's worth hundreds of millions, with 100% global recognition," said Polaroid's chief operating officer Jon Pollock. "That's our biggest asset." But not everyone is convinced that the fallen photo giant can claw its way back to the top. "When digital first arrived Polaroid had a tremendous opportunity to be a leader, but they passed on it, and it feels like their ship has sailed," said Alexis Gerard, president of imaging research firm Future Image. Polaroid will reintroduce its instant film and cameras, which were discontinued in 2008. The PIC 1000 camera is a redesigned, modern version of the old OneStep camera, and the Color 600 Instant Film will work with both new and old models. "We know instant film won't be the savior for the company, but it's important to bring back the old classic," said Pollock, the CEO of PLR. "Our customers unequivocally want this experience back, especially the art and fashion communities." Polaroid is also rolling out a portable printer, the "ZINK" (zero ink) printer which uses special paper that doesn't use ink or toner. It's also introducing LCD 1080p TVs in three sizes: 42", 52" and 65", as well as a Web-based photo and video sharing service called the Polaroid Studio. 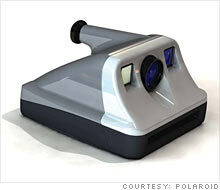 By the end of 2010, Polaroid claims it will have $1 billion of retail merchandise on store shelves. The company said it expects to make $600 million in retail sales this year, and more than $3 billion over the next five years. Gerard is doubtful. "For Polaroid to come back, they'd have to do something that captured the market in some way that goes back to their roots," he said. "I don't know what that is, but one thing I'm sure of: This product line isn't it." Indeed, Polaroid has tried extending its brand before, without success. The company, which was founded in 1937 and originally made polarized sunglasses, tried to lend its name to televisions and DVD players before it went bankrupt in December 2008. "The branding experience didn't work in the past," Gerard said. "There's definitely a passionate niche out there, and we'd all love to see the innovative Polaroid come back. But affection will take you only so far." 8 brands you loved, R.I.P.